Story: Bruce Lee stars in this no holds-barred martial arts adventure. At his powerful, gracefull best, Lee pulls NO punches as the star pupil of Shanghai's gung fu school. He finds himself caught up in a violent web of international terror and intrigue when he sets out to avenge the senseless murder of his beloved old instructor! I give this move 4 stars. It has a good story line and a lot better acting than his previous movie "Fists of Fury". 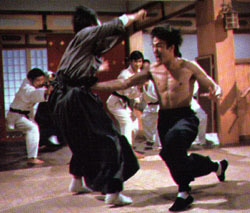 Not too mention some of the best fight scenes Bruce Lee has ever filmed! A pure classic! Hightlights: Two different amazing fight scenes between Bruce and an entire Japanse martial arts school, masters and all! Bruce creates some really interesting costumes disguising himself as an old man selling news papers, and even a phone repair man. It has yet another amazing long fight scene at the end. It is also the first movie to show bruce using much of his cat like movements. A real must see! What else can I say about this movie? Just awesome fight scenes!